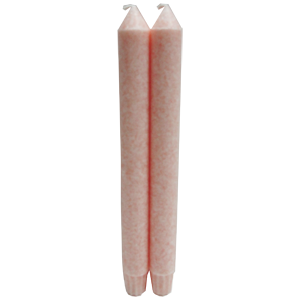 Pink Palm Wax Tapers.Beautiful 100% natural palm wax tapers are cleaner burning with pure cotton wicks which minimize soot emissions. Palm wax tapers do not bend or drip. Palm wax tapers will not warp or bend over time. They are virtually dripless so do not burn them in a drafty spot otherwise dripping may occur.